When you start gardening, one thing to always remember is that you’re never going to be able to keep nature away from it. A gardener’s mission is to maintain the balance of nature and not to try to rule it. IPM (Integrated Pest Management) is a combination of knowing when a problem may occur in your garden (and the causes too). It helps you take the step you need for eliminating the problem even before it appears, controlling the changes and using only low hazard and economic procedures when they’re required. 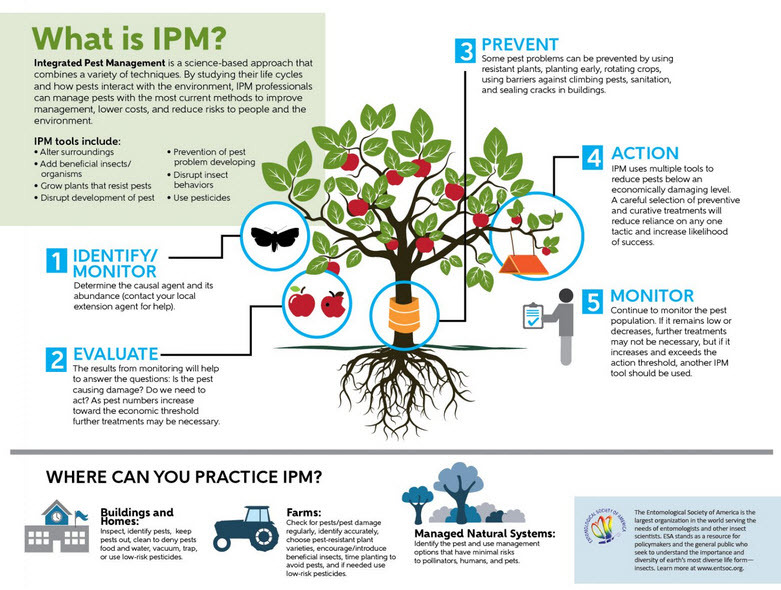 What is IPM in the first place? Prevention- Can you really prevent problems from happening in your garden? Analyzing- how much damage are you able to take? Controlling- is there anything you can do before the damage spreads even more? How to attract the beneficial insects? Can you use herbs as companion plants for deterring pests? What are the common organic pesticides? Integrated pest management (IPM) is a technical name for using intuition and foresight in your garden, in order to avoid any problems and to catch any of them as early as possible. 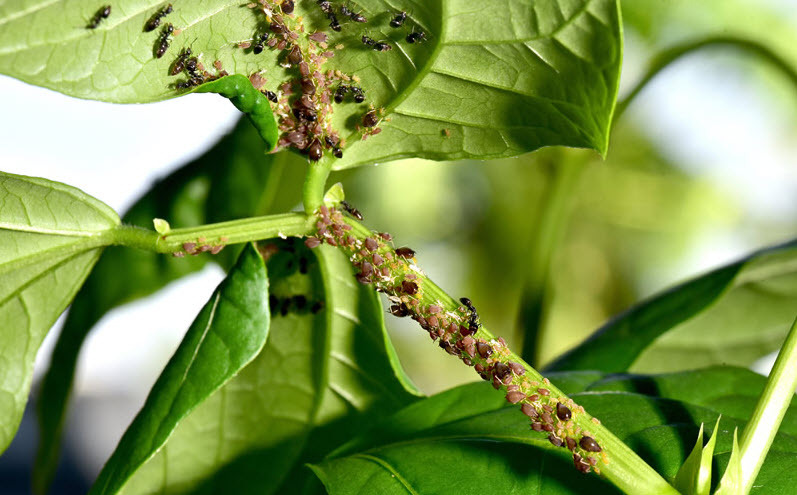 It’s the coordinated use of pest and environmental info for controlling pests so that you keep the risk for harming the people, environment and your property to a minimum. IPM was developed in the beginning for the commercial farmers as they were using too pricey synthetic pesticides. However, home gardeners were able to adjust the principles of IPM so it’s now used against vegetable garden pests, without the help from the synthetic pesticides. You need to monitor the problem. Is it only an isolated situation or a generalized problem? Analyzing the whole situation is fundamental. You need to figure out how much damage you’re able to take in your garden. You have to control it before the damage spreads throughout the entire garden. Eliminate all plant debris in the fall. You don’t want to have a shelter for the over-wintering garden spores and pests. Check your plants on a regular basis. Holes, webs, color changes and wilting are the very first signs of garden pests. Don’t forget to check the undersides of leaves too. It’s fundamental to know the precise nature of the problem. It’s important to know if the damage was caused by a rabbit, an insect, a disease or a nutrient deficiency. Chances are that an insecticidal soap on bacterial wilt isn’t going to be successful at all. You should also know if it’s a temporary problem or a spread one. Some problems are only seasonal. For instance, squash borers do grow up and leave your garden in the middle of the summer. It’s best that you have a rational reaction to the problem. You shouldn’t go ahead and use the sprayer on just one hornworm. Is the problem going to be gone before real damage is actually done? Does the insect only make the leaves ugly or it’s also harming them? Are you interested in sacrificing the dill for the sake of swallowtail butterflies? Is the problem going to solve on its own once the weather gets better? Are the insects going to move when the sun comes out? Keep an eye on the pest egg masses on the undersides of leaves and squash. Make sure you remove the eggs asap. Most of the beetles out there don’t move very fast (especially while mating) so knock them off into a big jar. Put some soapy water in the jar for best efficiency. You may get rid of the borers by cutting out the affected part of the plant. This isn’t going to kill the plant. At times, some pesticides are going to be necessary. There are plenty of organic and botanical pesticides that you may use even on your edible crops like vegetables. Start with one that is less toxic and move on to the next one only if you fail the first time. Keep in mind that organic pesticides may be harmful too. Some are toxic to animals, insects and plants and may even be toxic to human. Using a less toxic pesticide over and over again may actually be more damaging that a stronger type that you only used once. Remember that stronger doesn’t mean successful either and you may end up using one that an insect is resistant to it. Companion planting is an old tradition and a gardening technique as well. When you’re trying companion planting, you’re basically going to plant two or more plants near each other, so that they benefit each other. Higher yield, vigorous growth, attracting the predators of regular pests or keeping the pests at bay are only few of the benefits to mention. Scientific research doesn’t stand by the folklore or companion planting, but this method adds some diversity to any garden, to say the least, and it may even reduce the pest’s problems. It’s going to take plenty of trial and error until you get to know which plants go great together. For instance, anise is going to germinate better if grown near coriander, but that’s not the case for the coriander. Garlic is going to keep the Japanese beetles at distance, but planting it near anything from the pea/bean family isn’t going to be good for its growth. You should use companion planting for attracting the beneficial insects. Beneficial insects typically feed on regular garden pests (caterpillars and aphids). They’re the good guys and the main reason for which gardeners aren’t willing to use the spray insecticides sparingly. As insects feed differently during their stages of development, it’s fundamental that you also have a diversity of plant material for attracting them. Some beneficial insects do feed on pest insects, but they may also feed on nectar or pollen in some points in their life. In order to attract them into your garden, it’s essential that you ensure the host plants and the plants for the shelter too. Providing diverse plant material and season of availability is essential for companion planting. Hedgerows used to be really helpful in that area. The weeds, shrubs and trees would leaf out earlier than the crops during the spring, offering the early food sources. 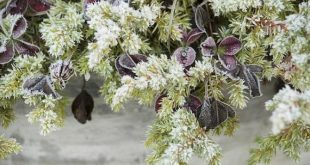 Many gardeners don’t use hedgerows nowadays, but combining some fruiting and flowering trees, perennials and shrubs is going to be helpful for sure. This combo is going to sustain your ornamentals and attract the beneficial insects as well. Plant composite flowers (chamomile and daisy) and mints (catnip, peppermint, spearmint) in order to attract the robber flies, hoverflies or the predatory wasps. Plant some tiny flowers for attracting the tiny wasps (dill, coriander, clovers, rue and yarrow). Herbs are great options as companion plants. They attract beneficial insects and keep the pest insects at bay. Their foliage and fragrance turn them into reliable companions in both ornamental border and vegetable gardens. Don’t forget that some factors in the environment may also play a role in the efficiency of companion planting. As long as you pay attention to the changes, you shouldn’t have any difficulties on creating the best balance in your garden. Keep in mind that an organic pesticide may become harmful too. Always use it according to its label directions. And no, more isn’t better in the case of organic pesticides either. Here are some examples of organic pesticides that you may use for your garden. They’re not only easy to use, but also really cheap too. This one contain sodium or potassium salts and some fatty acids. The soap has to come in direct contact with the insect in order to be effective. Once it’s dried, it’s completely useless. The fatty acids within the formula are going to penetrate the insect’s outer covering, making the cells to collapse. The big downside is that it may burn or stress your plants. Make sure you never use it in high temperatures or in full son. Some plants may be really sensitive to it, so remember to check the label first. Its formula is based on azadirachtin and liminoids- they both come from the seed kernels of the neem tree fruit. You can spray it straight onto plant leaves. This solution interferes with the hormonal system of the insects, blocking its development before the mature stage. It’s highly efficient on the immature insects and species that have to go through a complete metamorphosis. It’s not toxic to humans, but it washes away in the rain. It doesn’t work that fast and it even breaks down in the sunlight. You should also keep your pets away from the treated leaves until the leaves are completely dry. This one is made with highly refined petroleum oil and you can combine it with water. Spray it onto foliage as it coats and suffocates the insects, disrupting their feeding. This solution is low toxic to human, birds and pets, but doesn’t leave any toxic residue behind. It works especially against the soft bodied insects. It may burn the leaves and you need to make sure it’s the right season for spraying it. You may use it in combination with horticultural oil or any substance that is going to maximize the spreading and coverage of the leaves. You can get it in shops or prepare it your own. The minute you notice any sign of disease, spray it. You can use it also as preventive method, before the actual infection occurs. It seems that bicarbonates may destroy the cell wall, creating a pH that stops the further fungal growth. it works right away. You can use it as a preventative even for a couple of weeks. It’s safe to use on vegetables up to harvest. Make sure you don’t use it in full sun as you may burn your plants. It’s also wiser to test it on a small area before spraying the whole plant. It’s made with ground seeds of the sabadilla lily for this one. It comes as a fine powder, but you can use it as a spray. It works as a stomach poison and it’s highly efficient against the true bugs. However, it’s really toxic to bees and quite irritating to the mucus membranes of mammals. You should only use it if nothing else worked. IPM is going to maintain your garden in balance, eliminating some problems in the long run. You can use a combination of cultural, low toxic and environmental solutions to help the “good “insects stay alive. You need them for controlling the pest insects and to pollinate your plants too. If you find yourself in a pickle and to have to deal with a pest infestation, it’s better to try the organic methods first. They may be even more effective than expected. Previous Differences Between Desktop Vaporizer And Portable Vaporizer? Next How to save money on student accommodation?